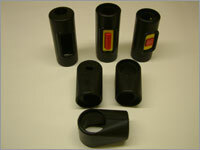 Moulded to socket over offset round straight padding up to 35mm bore. 110mm tall button type plastic switch. 124mm tall palm operated type cast switch. Molded to cover various teeclamps on oval seat rails. Protects the passenger from hard edges. Converts central Oval bore padding to Round offset bore padding.